Thanks to our donors, this past year was a time of significant growth for many Seva-sponsored programs and services. Your support has helped Seva provide vital sight-saving eye care to children and adults around the globe. 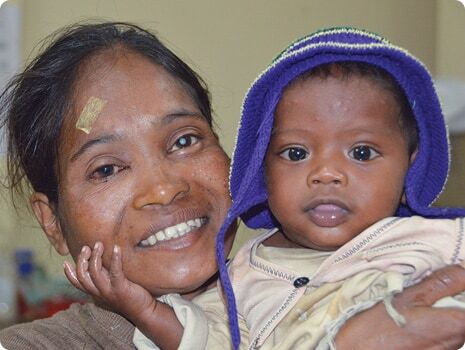 Over the past year, your generous support made it possible for Seva programs to provide transformational eye care services to 1,526,862 people across the world. Take a moment and imagine 1.5 million people – the population of Philadelphia, Pennsylvania – with expanded opportunities to contribute to their families and communities, and to provide for their own basic needs. You already know that our programs do more than restore sight. Thanks to your donations, Seva and our partners continue to provide training that leads to livable wage jobs for young women with limited economic prospects in developing countries. Your funds also propel forward advancements in technology and groundbreaking research that enable us to serve even more people more efficiently, making the most of every dollar. Each of these initiatives is driven by a deeply rooted respect for human dignity and a commitment to selfless – and effective – service. This annual report is a snapshot of how your donations have been transformed into compassion in action. We invite you to take a moment to connect with the individuals in the report photos. Imagine the little girl who was not able to go to school because she had to take her grandmother who had a cataract to the market. The grandmother can see, and this little girl can now resume her education and realize dreams of her own. Come with us and walk in the shoes of the son who carried his mother to an eye camp so that her sight would be restored. All the while, remember that you, in a very real way, are the hero in these stories. Without fear of exaggeration – we could not do this work without you. We are grateful for your trust and commitment to do this essential work. Eighty percent of global vision impairment is preventable or treatable. Avoidable blindness and vision impairment are surmountable problems. We hope you will join us as we look to 2019 when we will imagine what it would take to eliminate avoidable blindness in our lifetime. We can realize this big goal together. See the Impact You've Made! Your support has made an incredible impact on the lives of the world’s most vulnerable people. 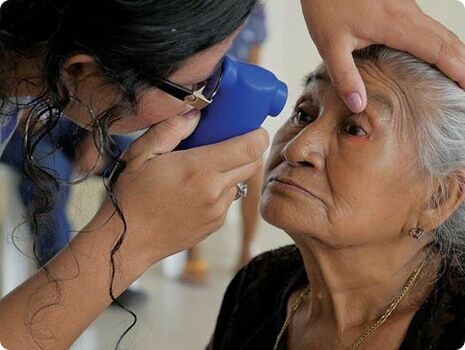 Restoring sight has been shown to be one of the most effective ways to relieve suffering and reduce poverty. Thank you for sharing the power of your generosity! Sometimes a little support can go a long way. 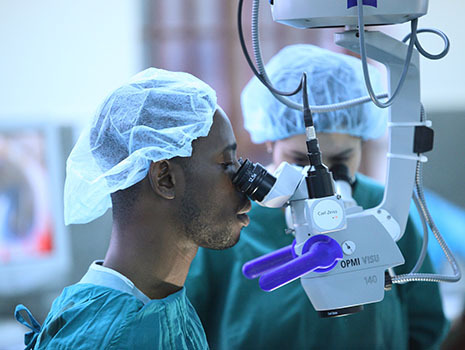 Bugando Medical Centre in Western Tanzania serves 16 million people but could not perform cataract surgeries on site for lack of an operating microscope. The ophthalmologist would have to transport the patient, staff and supplies to another hospital, perform the surgery, then transport them back to Bugando. "An operating microscope is such basic equipment, without which the program cannot function." 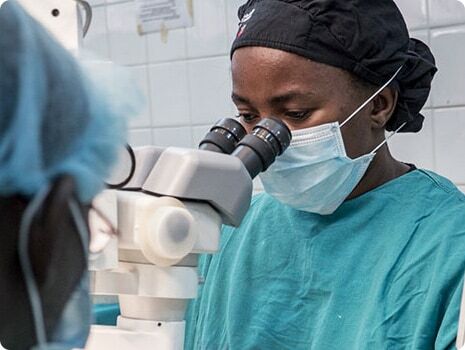 In late 2016, through Seva’s Global Sight Initiative, the Kilimanjaro Centre for Community Ophthalmology (KCCO) provided Bugando Medical Centre with funds for an operating microscope. KCCO is the largest organization in Africa dedicated to reducing blindness through community ophthalmology training, and Seva supports its capacity-building efforts by providing training and other resources. KCCO also supports outreach to rural areas to identify people who would benefit from cataract removal; provides surgical supplies; and makes counselling available to help reduce people’s fear of surgery and overcome other barriers to treatment. 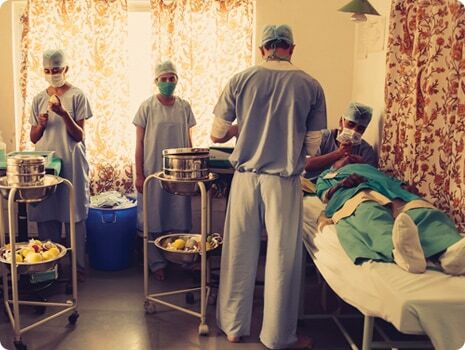 In the entire year before working with KCCO, the ophthalmology team at Bugando performed 27 cataract surgeries. In the first few months of 2017 alone, armed with their own microscope and other support from KCCO, they had already doubled that number. By the end of 2017, the hospital provided 478 cataract surgeries – nearly 18 times greater than in 2016! 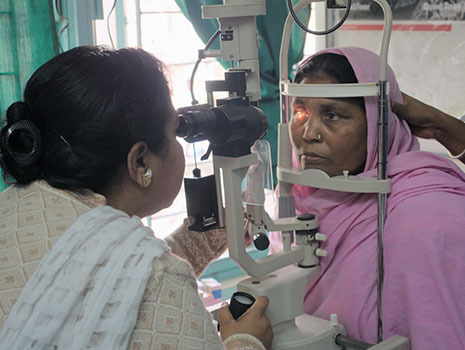 Seva supports training programs in over 20 countries for local eye care professionals with various levels of expertise. 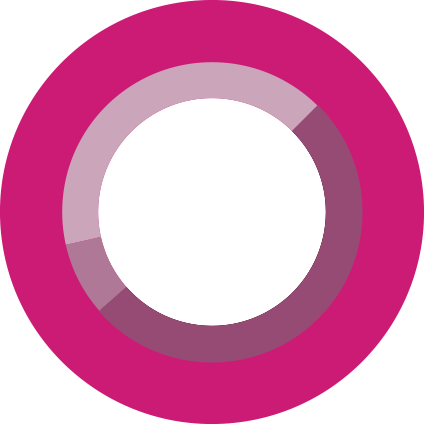 When ophthalmologists are supported by a team of skilled ophthalmic assistants, counsellors, and other trained eye care staff, their efficiency increases tenfold, greatly increasing the number of patients an eye clinic or hospital can serve every year. "Before the training, we didn’t know the details of surgical procedures. Now we can explain to the patient why [the surgery] is necessary. With counseling, we are able to help a lot of people." Additionally, these training programs boost gender equity by equipping more women in the workforce. 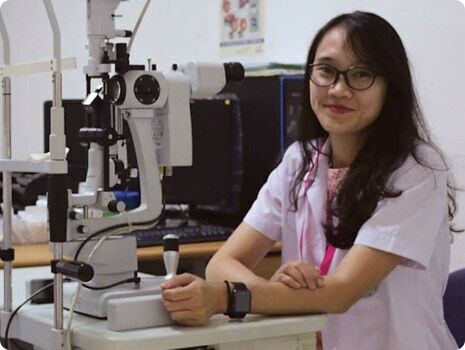 In many countries, eye care assistants and support staff are predominantly women, playing an invaluable role in guiding patients through the screening and treatment process. Through their practicum work in eye care programs, women gain valuable skills and are able to contribute economically to their communities. This affords them more independence than might have otherwise been possible. Seva promotes evidence-based interventions through systematic data collection and analysis. With Seva’s partners in more than 20 countries, data collection methods often need to be customized to fit the needs of each hospital. 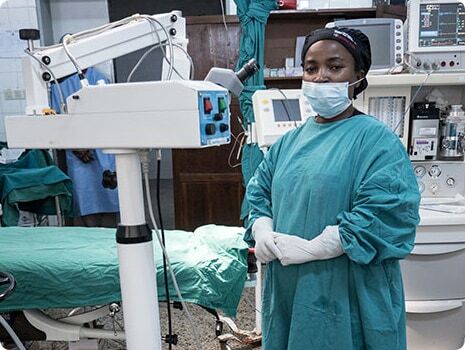 Many of the hospitals in the Global Sight Initiative (GSI) network operate within unique cultural contexts, yet often face similar obstacles. 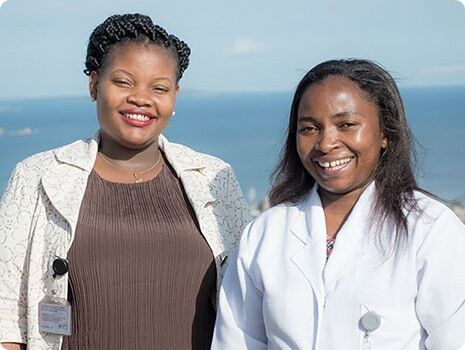 Through GSI’s mentorship model, hospitals are able to exchange useful information focused on improving methods for capturing data in order to analyze, compare, and share statistics across our network. Vivekananda Eye Hospital in Karnataka, in southwest India, reported an impressive increase in productivity thanks to mentorship support through GSI. This hospital went from performing 435 cataract surgeries to 841 cataract surgeries this past year, a 93% increase! Aravind Eye Care System recently hosted a GSI Mentee Workshop in June at the Sankara Eye Hospital in Odisha, India. The workshop convened 10 mentee hospitals from India and Bangladesh along with mentor institutions from Guatemala, Peru, and Tanzania to focus on the importance of capturing data to illuminate opportunities for improvement. With ongoing support from GSI mentor institutions, mentees work to increase their hospitals’ performance. Last year, your compassion helped provide 1,526,862 men, women, and children with eye exams and screenings in their communities. Seva produced 5 peer- reviewed journal articles, one book chapter, and the widely acclaimed “A Situational Analysis: Eye Care Needs of Rohingya Refugees and the Affected Bangladeshi Host Population in Cox’s Bazar District Bangladesh” reaching a readership of more than 144,000. Because of you, 5,912 individuals were trained last year, including 1,921 women who became health volunteers in their communities, reaching people in rural areas. Seva will continue to promote and implement universal access to comprehensive, quality eye care services in the coming year by establishing 20 new primary eye care vision centers (PECVCs) globally. We will provide comprehensive eye care to 1 million children by the end of 2020, and screen 100 Native patients through the American Indian Sight Initiative (AISI) Telemedicine Project in New Mexico – and much more! We will continue to focus on holistically strengthening each partner eye hospital and its capacity by expanding Eyexcel in Latin America, adding 10 mentee hospitals (from Bangladesh, Mexico, and Pakistan) to the Global Sight Initiative, and supporting the training of more skilled ophthalmologists and specialists around the world. Seva will support the continued expansion of evidence-based learning by sharing lessons from the American Indian Sight Initiative (AISI) telemedicine project to improve implementation of future initiatives, reporting results from assessments of avoidable blindness around the world, and scaling up the learning exchange and management within the Global Sight Initiative network to reach more people with better quality eye care. 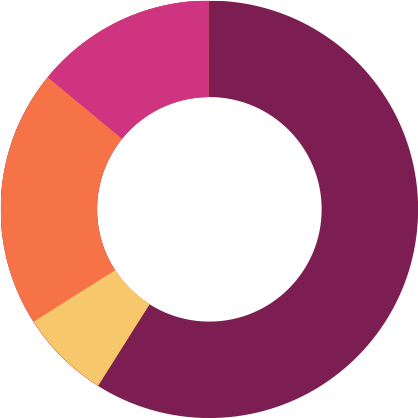 The financial information as of and for the year ended June 30, 2018 has been derived from Seva Foundation’s financial statements audited by SquarMilner LLP independent auditors. The condensed financial information should be read in conjunction with the 2018 audited financial statements and related notes. Contact Seva Foundation’s office for copies of the complete audited financial statements. It has been an amazing year and our hearts are full of gratitude for each of our committed supporters. We want to say a special thank you to the following individuals for all of their hard work! ©2018 Seva Foundation. Seva Foundation is a nonprofit 501(c)3 charitable organization. All contributions are tax deductible to the fullest extent allowed by law. All rights reserved.